Hugo's spectacular buffet includes an array of housemade desserts. Photo courtesy of Hugo's. 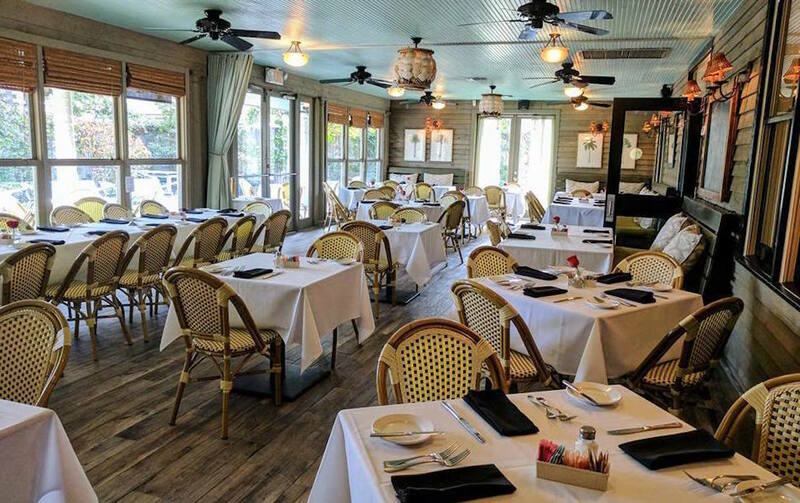 Moms who are great home cooks, Gulf Coast natives or longtime Southern gals deserve a delicious Mother’s Day meal in a beautiful restaurant where moms feel at home, but off duty. Seating at Ouisie’s Table include comfy rooms and a charming garden area. Photo courtesy of Ouisie’s. The venerable Ouisie’s Table (3939 San Felipe at Buffalo Speedway, 713-528-2264) features a special Mother’s Day a la carte brunch menu on Sunday, May 14, as well as dinner service. For an added flourish, the restaurant’s in-house florist, Oui Petals & Events, can adorn the table with a bouquet of wildflowers to take home after the meal for just $20. Hours for the special Mother’s Day Brunch are 10 a.m. to 3 p.m.; Mother’s Day Dinner runs until 10 p.m. Reservations are strongly encouraged. Brunch in a stylish bungalow at the recently opened Nobie’s. Photo by Jack Thompson. Wowing diners since its debut last fall, Nobie’s (2048 Colquitt Street, just off Shepherd, 346-319-5919) is launching brunch service just in time for Mother’s Day. Set in a charming Montrose bungalow, the quaint-yet-hip venue is named after chef Martin Stayer’s grandmother. The Mother’s Day brunch menu, which runs from 11 a.m. to 3 p.m., features avocado toast, house-made pastries (including giant cinnamon rolls served in cast iron skillets), poached eggs and grits, and the Freakin’ Weekend Tower, a shareable bagel stack served with a variety of schmears and toppings. While the restaurant doesn’t typically take reservations, Nobie’s is accepting them for Mother’s Day brunch. Hugo’s, located in a restored 1925 brick building (1600 Westheimer, 713-524-7744), might qualify as the Mother of All Brunches in Houston, certainly in its Montrose ’hood. Hugo’s “¡Día de las Madres!” Mother’s Day Brunch buffet runs from 10 a.m. to 2 p.m., with live music by Viento starting at 11 a.m. The phenomenal brunch spread features cuisine from many regions of Mexico, with prices at $42 per person and $15 per child, not including beverages. Reservations are strongly recommended. Pick up a discounted copy of The Enchilada Queen Cookbook during Mother’s Day brunch at Sylvia’s. Photo courtesy of Sylvia’s. Chef Hugo Ortega’s other restaurants host similar Mother’s Day experiences, which may have availability if Hugo’s is booked. Caracol, near The Galleria (2200 Post Oak Blvd #160, 713-622-9996), features a Coastal Mexican Mother’s Day brunch buffet with live music by Ikaru. Xochi, in the new Marriott Marquis downtown (1777 Walker, 713-400-3330) showcases the food and spirits of Oaxaca, such as moles, corn, peppers and the smoky spirit mezcal. Both locations of Sylvia’s Enchilada Kitchen (6401 Woodway, 713-334-7295; and 1140 Eldridge Parkway, 832-230-3842) celebrate Mother’s Day with an expanded brunch, numerous specials for dinner, plus a rose for every mom. She might also enjoy a copy of owner Sylvia Casares’ beautiful The Enchilada Queen Cookbook. There’s a 20-percent discount on the sales price that day. Brunch service runs from 11 a.m. to 3 p.m. and starts at $19.95 for adults ($24.95 with mimosas) and $10 for children under 12. Children 4 and under eat free. Both restaurants are also open for dinner. Have a mother who savors the nuances of each wine and relishes special settings? Be sure to take her to a place that will delight her senses. 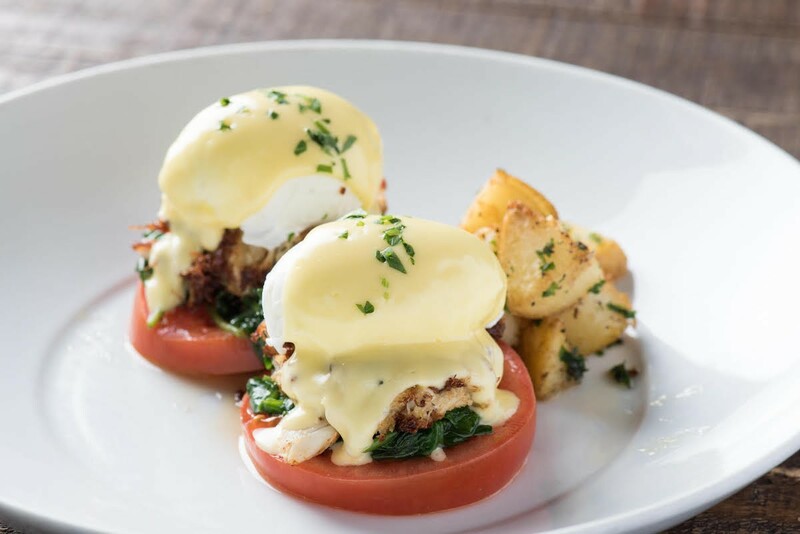 Brunch a la CRÚ pairs dishes, such as crab cake Benedict, with fine wines. Photo by Robert Yu. Elegant yet casual CRÚ Wine Bar serves up more than 30 wines by the glass, plus an extensive bottle list, alongside Napa-style food pairings. Enjoy CRÚ’s pleasant indoor/outdoor atmosphere at two locations: River Oaks/West Ave at 2800 Kirby, suite B-130, 713-528-9463; and The Woodlands/Market Street, 9595 Six Pines, suite 650, 281-465-9463). For Mother’s Day, both locations feature a three-course, $30, prix fixe brunch, while a kids’ menu is half the price (for ages 12 and under). Reservations accepted. 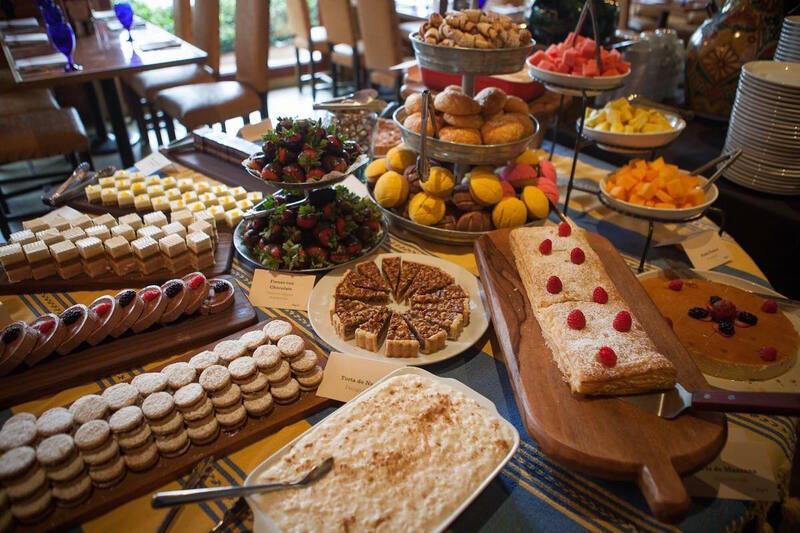 Head to Hughes Landing in The Woodlands to enjoy brunch on the water. Photo by Chuck Cook. Also in The Woodlands, newly opened Broken Barrel, with peaceful waterfront views at Hughes Landing (1950 Hughes Landing Blvd, Suite 1900, 713-389-5628), showcases chef Hilda Ysusi’s shareable plates with global influences. 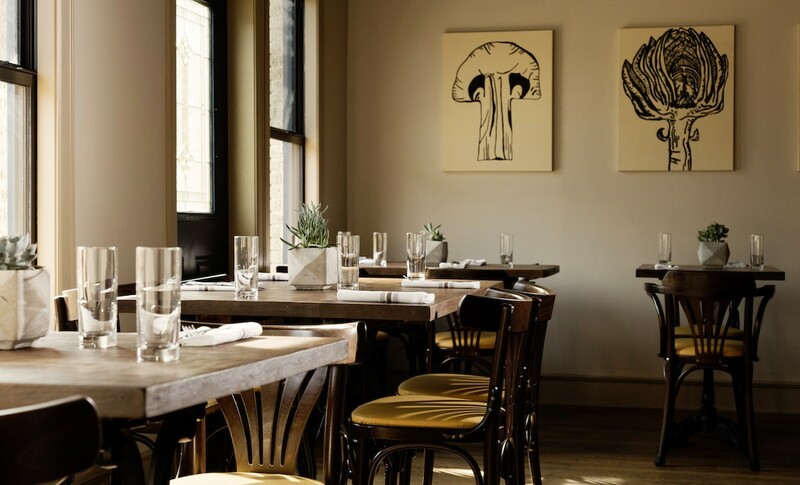 The restaurant, decked out in modern, inviting style, offers a special Mother’s Day brunch menu, with options such as smoked salmon flatbread with capers and chili oil; and grilled asparagus and poached egg with green pepita salsa. The menu is available on both Saturday and Sunday, May 13 and 14. Take Mom to the delightful Radio Milano, in City Centre’s Hotel Sorella. Photo by Debora Smail. On the west side, chic Radio Milano located in Hotel Sorella (CityCentre, 800 Sorella Court, 713-827-3545) delivers a three-course, $30, prix fixe Mother’s Day menu. Chef Jose Hernandez’s menu includes asparagus soup with smoked salmon, chives, oil and sesame seeds; and chicken and waffles topped with bourbon barrel maple syrup. No matter which of these restaurants diners and their moms end up at, some excellent dishes and graceful drinks are sure to be in store.